Ship Weight : 0.5 lbs. 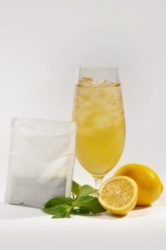 Check out this Meyer Lemon Iced Tea - 24qty 1oz. Filter Bags. Two Leaves Tea in Meyer Lemon is a well-balanced citrus tea. A citrus fruit native to China, the Meyer Lemon is a cross between a lemon and a mandarin, helping to balance out the tartness of the lemon flavor. Two Leaves Tea in Meyer Lemon can be ordered by the case. Each case includes 24, 1 ounce filters.